An Israeli air strike on a refugee camp in the Gaza Strip has killed three Hamas militants following a day of violence in the territory. 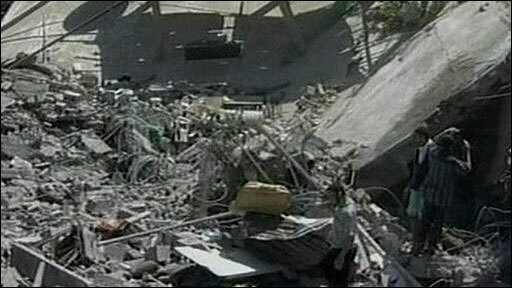 Earlier seven people, including a baby, were killed in a blast that destroyed the home of a Palestinian militant. Hamas, which controls Gaza, initially blamed the explosion on an Israeli air attack. Israel denied any involvement. Hamas said later it was investigating the incident, which prompted militants to fire dozens of rockets into Israel. A 59-year-old woman is said to have been seriously wounded in the barrage. The air strike on the Jabaliya camp in northern Gaza killed three Hamas gunmen as they were preparing to launch rockets into Israel. one who died in a gun battle with Israeli troops in the northern Beit Lahiya area. Egypt is currently trying to broker a truce between Israel and Hamas. Israel said on Wednesday that it would support Egypt's efforts but instructed the army to prepare for possible military action in Gaza if they failed. Senior defence official Amos Gilad travelled to Cairo on Thursday for talks with Egyptian intelligence chief Omar Suleiman. The blast at the house of senior Hamas bomb-maker Ahmed Hamouda shook the town of Beit Lahiya in northern Gaza. Israel usually confirms its air strikes in Gaza and its denial and the Hamas enquiry raised speculation the explosion may have been caused by militants mishandling explosives. A Hamas statement said the seven dead included a senior aide to the Hamas interior minister. 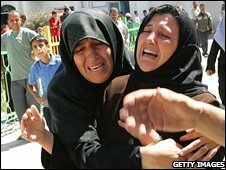 Mr Hamouda was not inside the house at the time of the explosion, Hamas said. Neighbours brought digging equipment to search for survivors and three people covered in blood were carried away on stretchers. Witnesses spoke of a "huge explosion" which totally destroyed the building. "There are people still buried under the rubble," said neighbour Majid Abu Samra. "I evacuated two women who were covered in dust and blood in my car." Shortly afterwards, Hamas said it had fired a barrage of 50 mortar shells and rockets toward southern Israel.